Wow, I feel like I was a posting machine for a couple of weeks and then wham-- radio silence. I didn't burn out or anything, just got involved in finishing up a couple of projects that have kept me away from the computer. 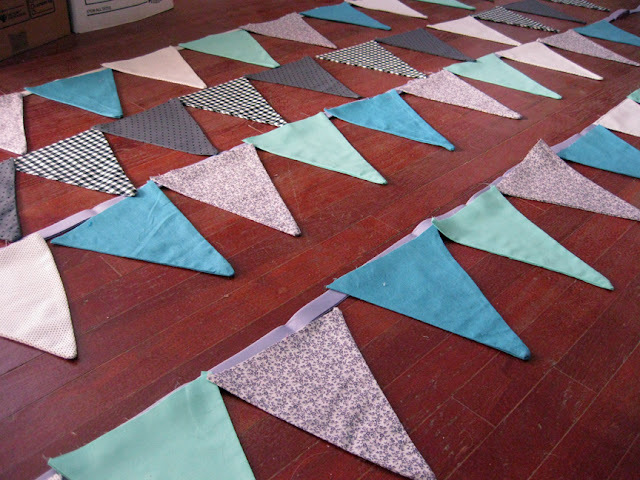 One of them is making bunting flags for my friend's baby shower. I wanted to contribute something to the decor that wasn't disposable and could be used to decorate her nursery in the long term. Since the organizers hadn't chosen any colors, I started with some old fabrics that I had on hand and then bought a few more that tied them all together. I would have preferred warmer shades of orange and yellow, but those just didn't appear. Fate sent me green and blue. I wish that I'd been able to find nicer patterned fabrics too, but I went to the fabric store closest to my house, and their selection was not good. I feel like they'll be fine, but could be better. Oh well. They also took much longer than anticipated due to sewing machine angst. (Old machine = temperamental and I'm not knowledgeable enough to adjust accordingly). I'm just going to send them off (baby shower is in Northern California) and advise that the flowers bring in bright contrasting tones. I think they're lovely - especially the touch of gingham - really brings it all together. Is this the same couple you did your circus nursery for? Emma-- Yep, the same couple. The flags looked a lot better once they were sewn together. The ribbon on top tied them together, and I added a little more color by using two different contrasting threads. So pretty! I love bunting. And what a lovely present for a baby shower!